Parker Classic fountain pen from the 1980s. Matte black with gold plated trim. Medium gold plated triangular nib. Ships with a Parker converter installed. New old stock in mint condition. 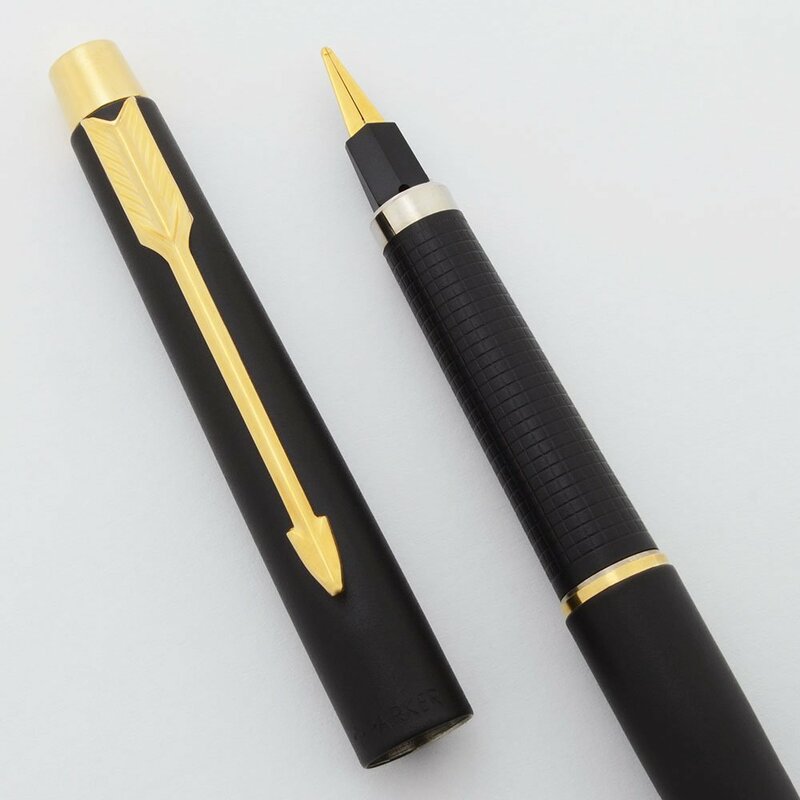 Type Fountain pen, very slender, with an interesting nib. Not a model we see very often. Manufacturer and Year Parker, USA. -- 1989 (the date code is a clear IN indicating 1989). Color Matte Black with an epoxy coating. The section has a grid pattern etched into it and the trim is gold plated. Nib Medium Parker gold plated steel triangular nib. There is an M on the nib collar. The nib writes smoothly. Its design is based on the Parker 180 reversible nib but it wasn't advertised as such, and while you might be able to write with it upsidedown, it isn't much different than the other way in terms of line width. Condition New old stock in mint condition. No scratches, dents, cracks, dings, or personalization. The imprints are clear. The pen is sleek and elegant.